In Victorian England, the profits of the Industrial Revolution have given rise to a wealthy upper class of English ladies and gentlemen. Sadly, you are not among them. But you do have a rich uncle, recently departed, who decided on his death bed to leave all his money to the relative who will enjoy it the most. To find out who that is, you and your cousins will each be given a substantial sum of money. Whoever can spend it the fastest will inherit all your uncle's wealth. 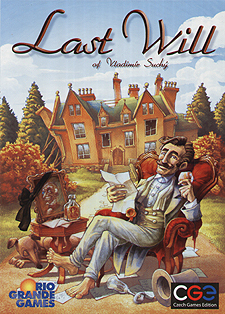 Last Will is a race to bankruptcy. In each round, you choose a plan for the day, which determines how many options you will have available and how much time you will have for them. If you don't give yourself enough options, you might find yourself with nothing left to do after attending the theatre. If you don't set aside enough time, you might have to forgo dinner prepared by London's most famous chef or a carriage ride with a charming guest. And don't neglect your property investments. Or rather, do neglect them: Once your properties depreciate, you can sell them for a pittance, bringing you that much closer to bankruptcy. The upper class lifestyle provides you many opportunities to spend your uncle's money. Just be sure to spend it fast.